Blue sky, sun, a gentle breeze – what a perfect morning to ride to work! 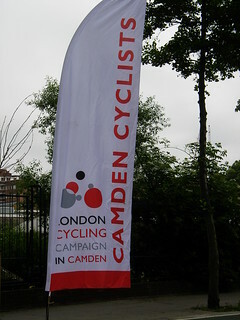 For those lucky cyclists whose route took them down Ossulston Street on 17 June, what a perfect opportunity to stop for a fresh croissant or a pain au chocolat while getting their bikes checked or marked at Camden’s Cyclists’ Breakfast. 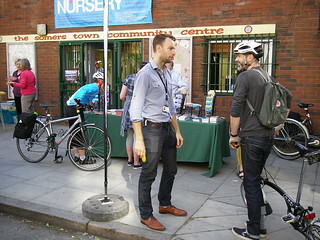 For the second year, we used the services of Somers Town Community Cafe, which provided ample snacks and drinks. 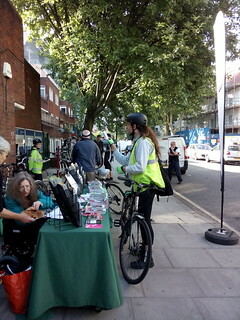 Between 8 and 10 a.m. , over 200 cyclists stopped for a bite and the chance to get their bike checked over and security marked while they had a chat and checked out the information on display. Mary organised the food table while Helen looked after the information desk and collected the names of cyclists who would like to get our newsletter in future or who would like to join LCC. 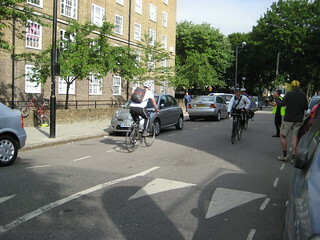 Ben Knowles perfected the knack of handing out bananas to passing cyclists who were in too much of a hurry to stop. 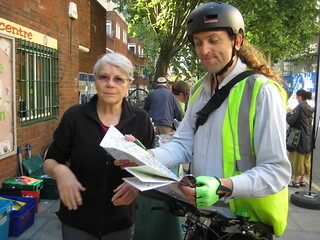 Paper maps are still popular, despite gadgets on handlebars. 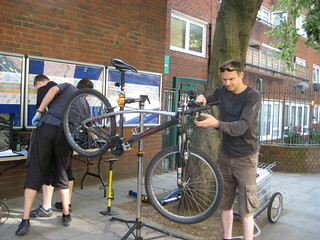 The mechanics were kept busy adjusting, tightening, pumping – the Dr Bikes provided by Camden were kept busy all the time. And the Police provided a Bike marking service which was much in demand. Angela took up her station on the corner where the cycle track curves round, giving advance warning to oncoming cyclists. 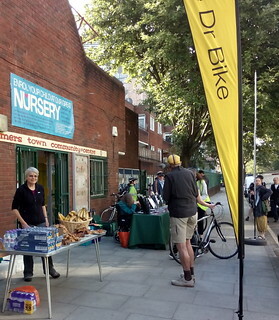 While some are always rushing past to get to work, her shouts of “Free Cyclists’ Breakfast! Get a croissant while you get a bike check!” was loud enough to draw plenty in. Account by Angela, photos by Angela, Susan and Jean. Have a look at enlargements of our photos on Flickr .